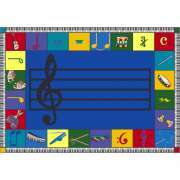 Brighten up your learning space with classroom rugs from Joy Carpets. 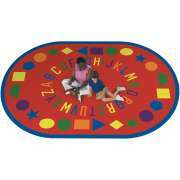 Colorful preschool rugs take up virtually no space, yet contribute tremendously to the overall feel of a classroom. 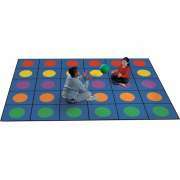 With a great selection of educational and fun graphics, any preschool or daycare can find fun designs for their space. Joy Carpets kids&apos; rugs come in many shapes, colors and designs. They will bring life to any room, making a space warmer and more inviting. 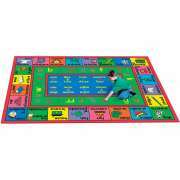 With Made in the USA quality and a great warranty, you can rest assured that this investment will adorn your learning space through many group games and class activities. 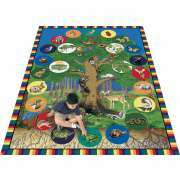 Classroom rugs aren&apos;t just for decoration, they can also serve a number of functional purposes. While children are still learning about shapes and coordination, they can be used to designate a particular area for reading hour or circle time. This arrangement will create consistency and help children figure out exactly where to sit. 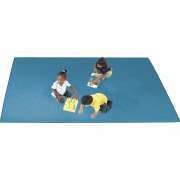 Little ones can be instructed to sit around the edge or huddle together in the middle. 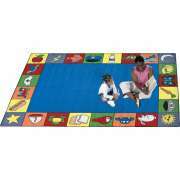 Teachers can even make games to create seating formations that are based around the graphics on their kids&apos; area rugs. 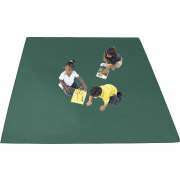 Classroom carpets can also be coordinated with classroom colors to create a more appealing space. 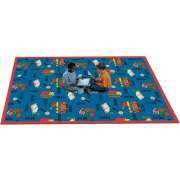 Little ones can learn even as they play, sit and walk around the room, when there are children&apos;s rugs on the floor. Even when teachers aren&apos;t actively engaged in activities that are centered around the classroom carpet, curious young learners will be enticed by the engaging colors and interesting graphics. Many of the designs can also be deliberately incorporated into lessons in an early-childhood setting. Children can learn by matching pictures to letters, pointing out shapes and colors, or choosing a graphic that expresses their feelings. 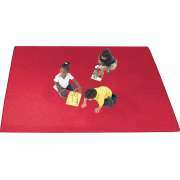 The main learning space isn&apos;t the only area where a classroom rug can go. If your preschool has a special room for music, art or science, why not enhance the space with an appropriately-themed carpet? 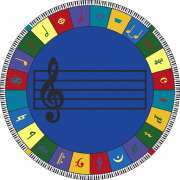 Joy Carpets offers some great options such as seasons and weather, music, flags of the world, symbols of America and even specialized language carpets. Little ones will have tons of fun learning through the graphics and will be able to visualize and absorb lessons better with these versatile educational materials. 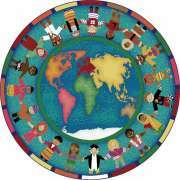 You can still enjoy some great graphics, even if you are not looking for childrens&apos; rugs with a particular educational purpose. 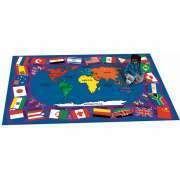 Fun rugs that include roads, bridges and buildings will fit perfectly in a preschool learning center where there are toy cars or building blocks. 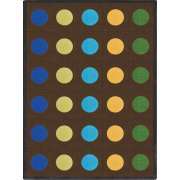 Alternatively, if your room is already full of pictures and excitement, solid-colored rugs are available as well. 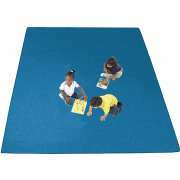 No matter how large your space is, and how it is arranged, you can enjoy the benefits of a classroom carpet. 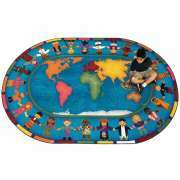 Oval or round rugs are perfect for circle time because they will help children know just where to sit to create a proper formation where everyone can see each other. Square and rectangular rugs are great for that large empty space in the middle of the floor or underneath the board. With little ones walking around the room all day, you want to be sure that your educational carpets will stand up to the wear and tear. Joy Carpets are designed for the rigors of active children with double-stitched serged edges for maximum durability. Anti-microbial protection prevents the spread of germs, while injection die technology keeps colors vibrant through many years of use. 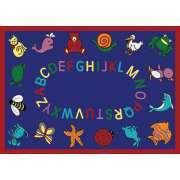 Let Hertz Furniture&apos;s wide selection of classroom rugs from Joy Carpets provide the finishing touch to your preschool or daycare. 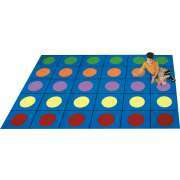 With colorful educational graphics, a variety of shapes and sizes and guaranteed endurance through many years of use, you can be sure that these kids rugs are well worth the investment.